Theory of profit with Islamic directions deals with an important but controversial and neglected subject in economics. The reader would find the narration interesting and Innovative. For, it does not discuss profit theories of various writers separately in chronological order; instead, the book identifies issues in the area and analyses the views of various writers on each issue to propose restructuring of the theory as per Islamic directions. The issues raised include the definition and seat of profit, the cause of its emergence and its sources, the motivational aspects and impact on allocation of resources and incomes distribution, the nature of profit and the regulatory policy role. The work concludes that the source of prevalent confusion on the subject lies in defining profit as a cost – revenue differential of firms and the insistence at the same time that it is exclusively attributable to the entrepreneurs who tend to be vanishing in the modern corporate era. For a reformulation of the theory to get rid of inconsistencies, the work suggests that profit should be viewed only as a cost-revenue differential delinked from reward, the firm not the entrepreneur should be the focal point for its study, the surplus beyond normal profit must be shared between capital and labor, subject to a minimum wage constraint, to promote social harmony and distributive justice. The book may attract the general reader for a lucid narration on a topic of common interest. The academics may find it interesting because of its historical updating and novelty of treatment. University students are to benefit most as the work would supplement their knowledge in related areas of economics. INCEIF: The Global University of Islamic Finance has awarded on the occasion of their 7th Convocation held on August 24, 2015 the title ‘Emeritus Professor’ to Professor Dr. Zubair Hasan (1932), a former faculty member of the university. Hasan is the first Emeritus Professor from the University. 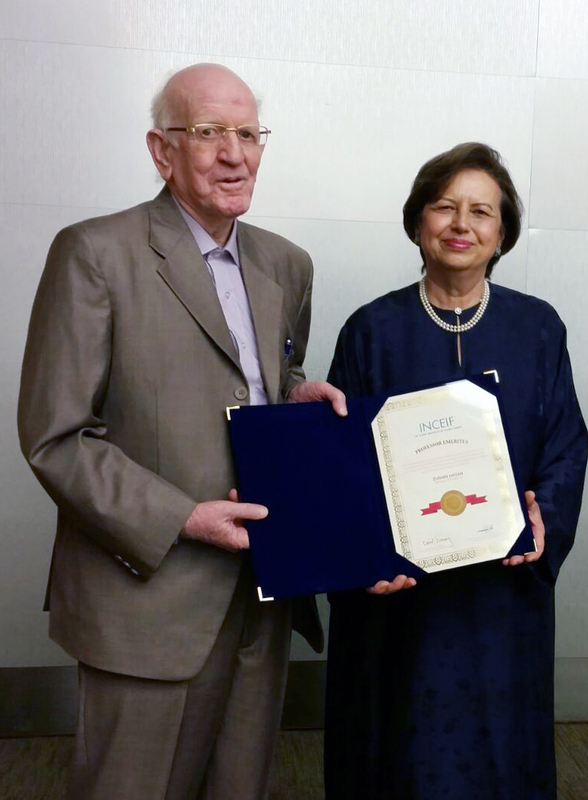 The citation presented to him by INCEIF Chancellor, Bank Negara Malaysia Governor Tan Sri Dr Zeti Akhtar Aziz recognizes his distinguished service to the Institution in particular and to the Islamic finance industry in general. In his recitation prior to the presentation of the award, INCEIF Deputy President Academic Prof Datuk Dr Syed Othman Alhabshi commended Prof Zubair for his accomplishments and tireless efforts in the promotion of Islamic economics as well as Islamic banking and finance. The efforts have earned Prof Zubair, many distinctions, he said, including the prestigious Islamic Development Bank Prize in Islamic Economics in 2009. He also received the COMSEC Academic Award at the OIC Annual meeting at Istanbul in 2014. The rendition counted contributions of Hasan to knowledge in the form of books, numerous articles and conference presentations and multifarious services he rendered to half a dozen higher educational institutions he enriched with his teaching research supervision and administrative contributions over a professional career spanning 58 long years. Before his departure from INCEIF Professor Zubair gave them the idea of creating a ‘knowledge waqf, to which he donated his rich collection indexed at their KMC for placement as ‘Zubair Hasan library’. Professor Zubair Hasan accepted the award in humility and gratitude. He quoted APJ Abdul Kalam the late president of India as saying “Dreams are not those that we see in our sleep. Dreams are those that do not let us sleep”. Such dreams he said give people their mission. And it is the relentless pursuit of such missions that makes for example a school dropout like Mohammad Rafi the singer of the century, a railway station tea seller, the Prime Minister of India. The greatest of all such missions is to acquire education. The Holy Qur’an opened with the exhortation to ‘read’. Hasan lamented that with the passage of time Muslims left education, the leadership of the world left them. Education and education alone is the road to revival of the past glory. Deriving from a saying of Keynes, Hasan said: And education is what is left in you after you have forgotten your class room lessons. The point is what sort of a person education makes you. Development in Islam means the development of human personality, an epitome of self respect, creativity, humanism and reasiness to suffer and sacrifice for ideals. Referring to the current state of education in the developing countries, especially Muslim Xubair Hasan observed: our lands are free, our intellect still is not. Everything – ideas, policies, course structure and reading materials all come from the West; they are prepared to meet their needs, solve their problems, not ours. Imitation benefits but innovators are always the leaders. His preference was to write textbooks for our students rather than publish articles in foreign journals. Much of the scarce foreign exchange spent on educational imports can thus be saved. (For more may see Zubair Hasan at Vikipedia). The Islamic banking industry posted a profit of Rs9.4 billion in July-September 2014, a substantial rise compared to Rs5.6bn earned by the industry during the same quarter of 2013. Karachi: Pakistan’s largest and leading Islamic bank, Meezan Bank and one of the country’s most prominent Takaful operators, Pak Kuwait Takaful Co Ltd have entered into an agreement whereby Pak Kuwait Takaful will provide Takaful (Islamic Insurance) coverage for the properties financed by Meezan Bank through its housing finance product ‘Easy Home’. In a special report on “Top Islamic Financial Institutions” published by renowned international magazine The Banker, being published from the UK. Meezan Bank is ranked as the Top Islamic Bank in Pakistan. This ranking was given to Meezan in recognition of impressive growth of its branch networks to becoming the largest Islamic Bank in Pakistan and its contribution to developing world-class Shariah-compliant financial products for Pakistan’s Islamic Banking market. Meezan Bank has been on a very fast growth trajectory since its inception in 1997 and has not only grown to be the largest Islamic Bank in Pakistan but is also ranked 8th amongst all banking institutions in the country. The year 2014 was an eventful year, where Meezan crossed the landmark of increasing their branch network to more than 400 branches in 115 cities across Pakistan and additionally took over the Pakistan’s operations of HSBC. In a well attended ceremony attended by Shariah Scholars, Senior Bankers, Academics, Central Bankers, Deputy Governor of State Bank of Pakistan Mr. Saeed Ahmed launched the second phase of mass awareness campaign to promote Islamic banking awareness in the country and to encourage the majority population to shift toward Islamic banking to have an Interest free and permissible (halal) banking system. The campaign is supported by 5 full-fledged Islamic Banks and 18 Islamic banking windows of Conventional banks and is fully endorsed by the Central Bank that is keen to promote Islamic Banking system in Pakistan. Speaking on the occasion Mr. Irfan Siddiqui – CEO of Meezan Bank highlighted the theme and importance of the message given in the campaign. He also appreciated the keen support of Islamic banking by Central bank and hope that Islamic banking will continue its growth and more people will come to Islamic banking as a result of this industry wide joint efforts to promote Islamic banking. Karachi-based utility K-Electric will test a seven year tenor for its latest Islamic bond, a 22 billion rupee ($217 million) transaction that would be Pakistan’s largest corporate Sukuk to date. Issuance of corporate Sukuk is gathering pace, helping broaden Pakistan’s Islamic capital market, which in recent years has relied on the government for the bulk of such deals. Proceeds from the Sukuk will help refinance debt, with approximately 18 billion rupees to be repaid to senior lenders including the International Finance Corporation and the Asian Development Bank, K-Electric said in a bourse filing. Meezan Bank Limited was joint Shariah Advisor of K-electric Sukuk transactions. Last year, the utility raised 6 billion rupees through a three-tranche Sukuk, investment certificates which follow Islamic religious principles such a ban on interest and gambling. The Securities and Exchange Commission of Pakistan (SECP) has established a specialized department to regulate the Islamic finance market. The Islamic Finance Department (IFD) would carry out the functions of Shariah regulations and compliance, product development, market awareness, Shariah securities market development and international liaison and networking. The SECP is entrusted with regulating a spectrum of Shariah-oriented companies ranging from Modarabas, non-bank financial institution, Takaful and non-financial firms. The total Islamic financial assets of Pakistan have reached over Rs1.7 trillion, around 10 per cent of the total banking assets, and 40pc of which are directly or indirectly regulated by the SECP. The Pak-Brunei Investment Company is in final stages to launch its Modarba fund as its special future venture, Managing Director (MD) of the company said. Company’s MD Ayesha Aziz informed Finance Minister during a meeting here that the first fund, based on Private equity model, will be established by March 2015 adding the company also has plans for establishment of specialized vehicles for warehousing/collateral management. The Pak Brunei Investment Company is an Investment Finance Company established as a joint venture between Government of Pakistan and Brunei Investment Agency (BIA) that commenced operations in August 2007. The Company has active platforms for Project and Lease Finance, Corporate Finance and Advisory Services, SME Finance, Private Equity, Trust Services, Capital Market Operations, and Fixed Income Trading and Distribution activities. MD Ayesha Aziz informed the Minister that the company started operations almost 8 years ago with a capital of Rs. 3 billion. The company has a current equity of Rs, 9 billion while its first SME branch was inaugurated in Lahore in October 2014. Pakistan’s capital market regulator has published long-awaited rules for the issuance of Sukuk, or Islamic bonds, as part of efforts to strengthen governance and broaden their appeal to investors. The regulator first drafted the rules in October 2012, but efforts have accelerated under a five-year plan that authorities hope will double the industry’s share of the banking sector to 20 percent by 2020. The rules come at a time when issuance of corporate Sukuk in Pakistan is gathering pace, helping broaden an Islamic capital market which in recent years has relied on the government for the bulk of such deals. Under the rules, Sukuk will have to be structured to comply with standards of the Bahrain-based Accounting and Auditing Organization for Islamic Finance Institutions (AAOIFI), as well as those set by the local regulator. Accounting and Auditing Organization for Islamic Financial Institutions (AAOIFI) has issued a new accounting standard on investment accounts – Financial Accounting Standard No. 27 (FAS 27) Investment Accounts. The new FAS 27 updates and replaces two of AAOIFI’s previous accounting standards relating to investment accounts – FAS 5 Disclosure of Bases for Profit Allocation between Owners’ Equity and Investment Account Holders as well as FAS 6 Equity of Investment Account Holders and Their Equivalent. This standard applies to investment accounts based on Mudaraba contracts which represent “equity of investment accountholders and on Mudaraba contracts that are placed on “short term basis” (overnight, seven days, one month basis) by other financial institutions as “interbank-bank deposits” for the purpose of liquidity management. However, it is not applicable to own equity instruments, Wakala contracts, reverse Murabaha, Musharaka or Sukuk. The present Provincial Government gives policy guidelines on banking, finance, trade and investment and assured that the Government is committed for the well being of common man with its resources. BOK is committed to cater the Banking requirements of Islamic Banking as well as conventional in a befitting manner in order to encourage the economic developmental activities in the region. BoK have increased our net-work by establishing 116 new branches by December 2014 and it will further enhance in 2015. This is a prime responsibility of BOK to provide Shariah Compliance schemes which are now getting encouraging results from the clients. A plan to combine three Malaysian banks to create one of Southeast Asia’s biggest financial groups has been scrapped, dealing a blow to efforts to create banking champions in one of the few areas of the world still enjoying relatively strong economic growth. The deal, unveiled in July last year, envisaged a combination of CIMB, the country’s second-biggest bank, with RHB Capital, a smaller bank, and Malaysia Building Society (MBSB). With combined assets of Rm613bn ($188bn), it would have overtaken Maybank as the largest banking group in the country. The collapse of the proposed deal is a blow to the region’s aspirations to create banking groups with the financial heft to help drive the further economic integration of the 10-nation bloc known as the Association of Southeast Asian Nations (Asean). The countries of Asean are expected to grow by a combined average of 5.3 per cent this year, according to the Asian Development Bank. The failure of the deal also scuppers the creation of what would have been a new “mega-Islamic bank”. Malaysia, Southeast Asia’s third-largest economy after Indonesia and Thailand, is by far the largest centre in Asia for Islamic finance, driven by its majority Muslim population and strong financial and political links with the Middle East. International Bank of Azerbaijan (IBA), the country’s largest and the only state-owned bank, plans to target the UAE and other Gulf investors as it plans to issue $200-$300 million debut Islamic bonds (sukuk) this year. IBA raised $252 million through an Islamic syndicated loan in 2014 from UAE-based Al Hilal Bank, Dubai Islamic Bank and Noor Bank. Other participating banks were Barwa Bank, Citigroup and JPMorgan. The bank, 50.2 percent owned by the Ministry of Finance, holds 40 percent of banking assets in the country. Gurbanzade told Reuters the bank would issue sukuk in the second half of this year in order to widen its credit policy, develop business and attract alternative sources of financing. “We plan to develop Islamic finances in Azerbaijan as access to financial resources on the Western financial markets is not easy due to the current economic situation,” Gurbanzade said. He said IBA’s Islamic assets rose to $526 million from $160 million in 2014. Awareness in Canada of Islamic banking has increased dramatically in the last few years. With the federal government’s efforts in this respect, Canada’s attractiveness to Islamic finance will grow impressively. Many Canadian Muslims are seeking Shariah-compliant banking solutions to their personal finances. They want home mortgages that are not based on conventional Western interest payments, but which operate more like a partnership. Even though Islamic banking has some harsh critics among Canadian Muslims who consider it unwieldy with many still suffering from the 2011 bankruptcy of Toronto-based UM Financial, which offered Shariah-compliant mortgages — the movement is gaining energy. In an unprecedented move in the development of the Islamic finance industry, the Accounting and Auditing Organization for Islamic Financial Institutions (AAOIFI) standards will be made available online through Thomson Reuters ‘ range of digital information platforms, including Zawya Islamic. AAOIFI Shariah standards are approved and developed under the guidance of its Shariah Board, which comprises the world’s leading Shariah scholars on Islamic finance and internationally regarded as the ultimate authority on Shariah for Islamic finance. The standards on accounting, auditing, ethics and governance are approved and developed by AAOIFI Accounting and Auditing Standards Board comprising senior representatives from major Islamic financial institutions, central banks and regulatory authorities, and international accounting and auditing firms. The standards represent the broadest consensus of rules that govern the Islamic finance industry and cover Shariah, accounting, auditing, governance and ethics. Demand for Islamic finance professionals in on the rise and even non-Muslims are entering into the industry whose assets are set to double to $3.4 trillion by 2018. The Dubai government has voiced its ambition to be a global capital for Islamic finance and Islamic banks now command a roughly 25% share of the banking market in Gulf Cooperation Council, according to an estimate by Ernst & Young, leading to a growing demand for professionals. Dynamic growth in Islamic finance has been driven by strong economic growth of the Gulf region. Investors from the Middle East and Asia are increasingly seeking to invest in products that are compliant with their religious beliefs. Surveys suggest that half of the Muslims world-wide would opt for Islamic finance if given a competitive alternative to conventional services. Dubai Islamic Bank (DIB) received “in principle approval” from the Kenyan regulator in January 2015, Chief Executive Officer Adnan Chilwan said at a press event in Dubai. The bank still needs to get its final license and expects to be operational in Kenya by year-end. The new bank will operate under the name DIB Kenya, Chilwan said. DIB will hold 70 per cent of the bank, with 30 per cent owned by local partners. There is growing interest in Islamic finance in Africa. GCC-based Shari’ah-compliant banks are well-placed to take advantage of that interest. Africa offers exciting growth prospects with seven of the 10 fastest growing economies in the world, including countries with significant Muslim populations, under banked either due to lack of access or for religious reasons, that should represent a ready market for Islamic finance. “Our participation banks are growing at around 20% annually right now. They need to grow faster and new players also need to become operational soon,” Aydin said. Four Islamic financiers are currently operational in Turkey, including Albaraka Turk, Bank Asya, Kuveyt Turk and Turkiye Finans. The country`s banking watchdog, the BDDK, recently gave permission to another state run lender. Indonesian authorities are pushing ahead with a plan to create an $8 billion Islamic megabank even after a similar proposal fell through in Malaysia. A combination of the Shari’ah-compliant units of government- controlled PT Bank Mandiri, PT Bank Rakyat Indonesia and PT Bank Negara Indonesia could happen as soon as this year, Financial Services Authority Chairman Muliaman Hadad. The megabank could help drive a quadrupling in Islamic banks’ market share to 20 per cent by 2018, compared with 10 per cent without it, the Indonesia Islamic Banking Association predicts. That would approach the 21 per cent level in Malaysia, where a planned combination of CIMB Group Holdings Bhd., RHB Capital Bhd. and Malaysia Building Society Bhd. was called off last month as falling oil prices damped the economic outlook. Credit rating agency Standard & Poor’s said it had updated its criteria for Islamic bonds to distinguish more clearly between issuers of Sukuk and sponsors of them. Sukuk tend to be more complex than conventional bonds because they use structures designed to avoid interest payments. They often involve special-purpose vehicles (SPVs) which issue the paper and lend the proceeds on to the ultimate entity raising money, which is known as the sponsor. S&P’s new criteria describe the conditions under which it would rate Sukuk at the same level as the sponsor’s rating. For example, Sukuk will be rated on a par with the sponsor’s senior unsecured rating if they provide contractual commitments by the sponsor to make payments that ultimately cover periodic distribution and principal amounts. The agency said it did not expect the new criteria to lead to upgrades or downgrades of the Sukuk which it rates, but it might withdraw a rating if terms and conditions did not meet the criteria. It estimated this might happen for fewer than 5 percent of rated Sukuk. Sukuk defaults are rare, but the revised criteria could help address market uncertainty about the contractual obligations of the various parties. Such uncertainty can affect Sukuk pricings, particularly for issuers with ratings below investment grade. For situations in which a sponsor is performing on its own obligations while Sukuk payments by an SPV are not full or timely, S&P said such temporary deferrals would not be classified as defaults as long as the agency expected payment within one year. New Islamic units of three state banks will accelerate Turkey’s plans to expand the share of Shariah-compliant assets, said Osman Akyuz, head of the country’s Islamic banking association. Akyuz foresees the country’s interest-free assets increasing by 30 per cent to $60 billion in 2015, up from 1.2 per cent growth in the 12 months through November, the latest reporting period. The government wants to increase the share of Islamic banking to 15 per cent in 2023 from about five per cent now. The three state banks — Ziraat Bank, Vakif Bank and Halk bank have pledged to quickly set up units for Shariah compliant banking. While “the existing players will have to review their policies and strategies,” the competition represents a healthy challenge to the four Islamic financiers, said Akyuz, who was formerly the chief executive officer of Albaraka Turk.